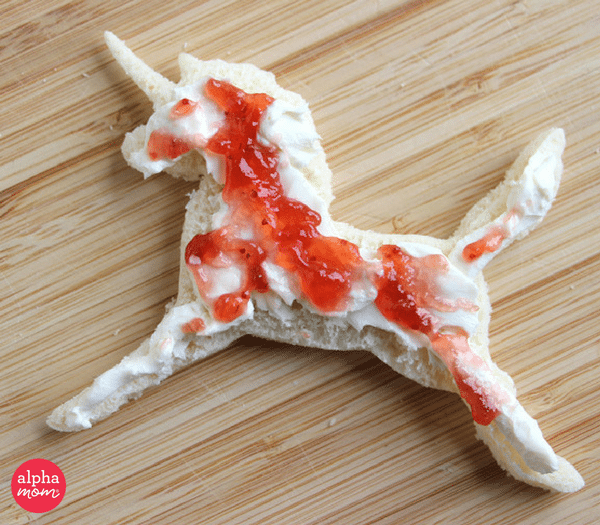 Do you have a child who loves fantastical, magical lunches? Does she think rainbows, unicorns and hearts are the most beautiful things in the world? 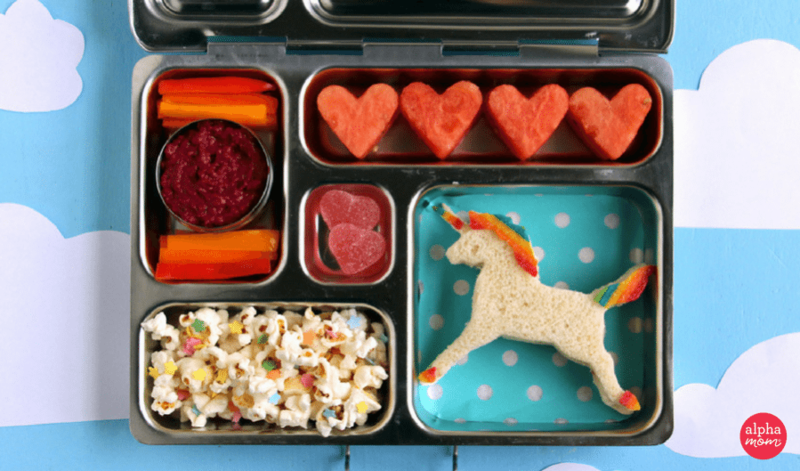 Then take a little extra time on an ordinary day to make her the happiest kid in the world with an amazing unicorn bento box! 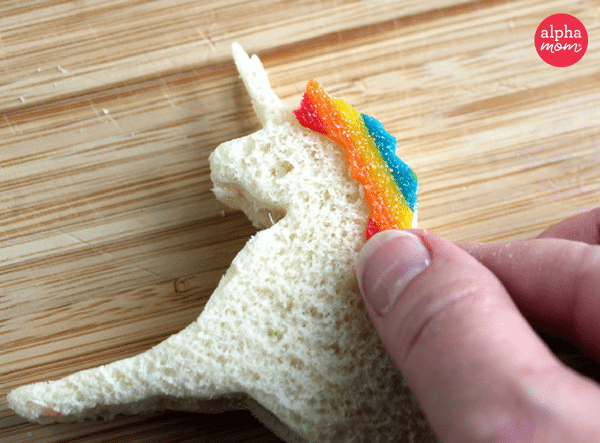 The most complicated part of this lunch is the unicorn sandwich, so let’s start there. 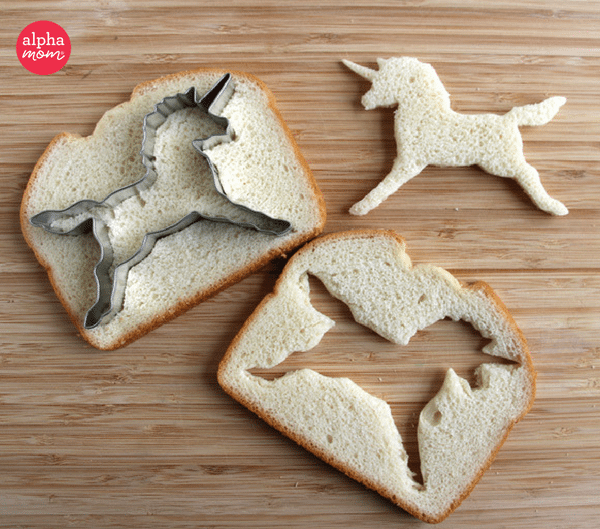 Cut two unicorn shapes from two slices of sandwich bread. I found that the detailed cutter I used tore the top of the cut-outs a little and gave them raggedy edges, so I flipped them over and had the bottom of the cut-outs with their nice crisp edges on top. I’ve found that sometimes when I am cutting a detailed image with a cookie cutter the bread gets stuck inside the shape — particularly in narrow areas like the unicorn horn or the legs in this example. If that happens to you, ease the bread out of the cutter using the tip of a knife or a toothpick, taking care not to rip the bread. Fill the sandwich with the fillings of your choice. I used cream cheese and strawberry jam and I was very careful to spread the two fillings gently so I didn’t tear the bread. I know this is a bit fussy for a weekday morning lunch, but the magnificent sandwich you are about to make absolutely justifies it, I promise! If you would prefer to fill the sandwich with meat and/or cheese use the unicorn cutter to cut those into the proper shape and layer them between the bread with any condiments. Now we are going to decorate the top of the sandwich with the rainbow candy. If you are not into the idea of sending candy in your child’s lunch you can skip this step, but in my opinion the rainbow accents totally make this sandwich so I vote that you include them. 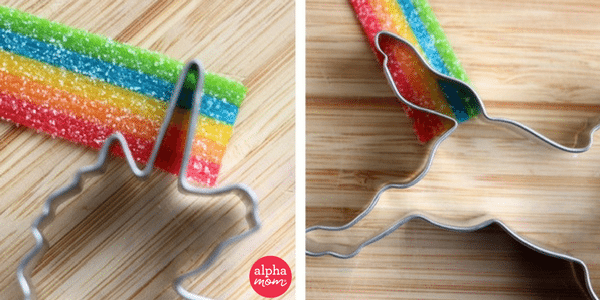 Lay the cookie cutter over the candy and use it to cut out just the parts you want on the top of the sandwich as demonstrated in the photos above. I cut out the unicorn’s horn, tail, mane and hooves. 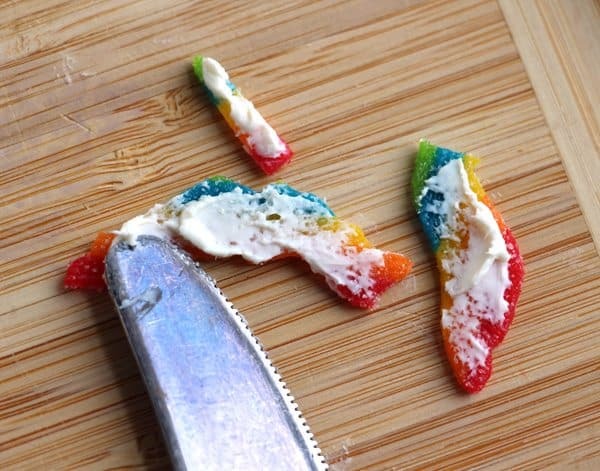 Spread a little cream cheese on the back of the candy to use as an edible glue. Then gently press the candy onto the top slice of bread and slip the whole thing in the largest section of the lunch box. 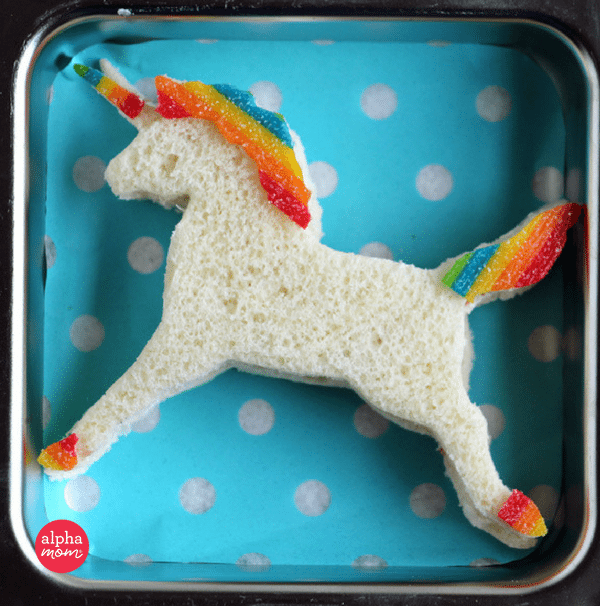 You can’t have a unicorn lunch without plenty of rainbows so let’s add a healthy version in too. 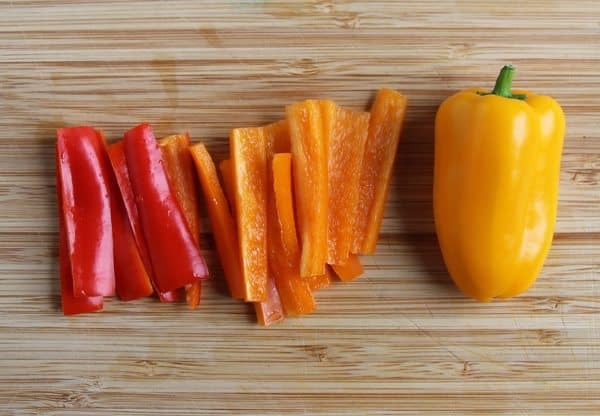 I sliced up three mini-bell peppers — one red, one orange, one yellow. You could use whatever other veggies you like in these colors too. Tomatoes, carrots and corn? Pick what your kid likes! 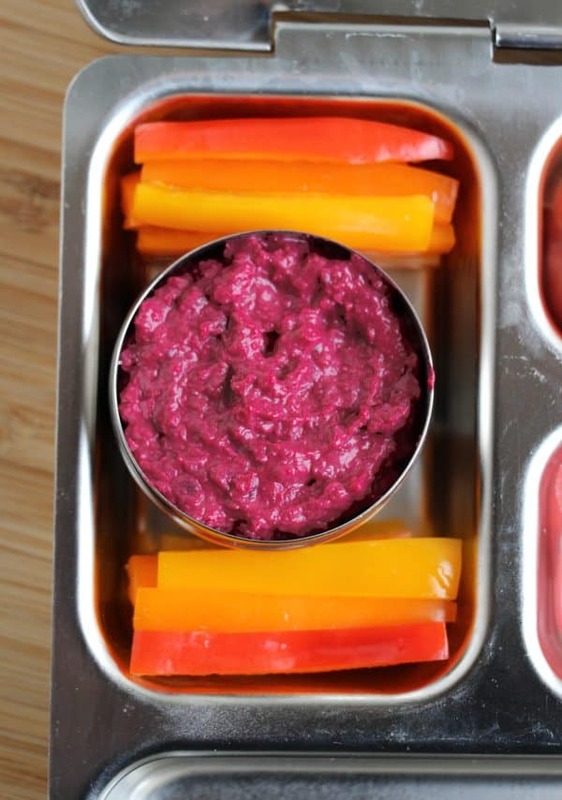 Arrange the peppers in rainbow order and tuck them in the box along with some beet and white bean hummus. The pink color nicely compliments the beauty of the rainbows and I’ve found my kids really enjoy the touch of sweetness the beets add. If you are having trouble finding beet hummus, I found mine at Trader Joe’s, but Eat Well Embrace Life also makes one that I’ve found in larger grocery stores. Or you can make your own with this tasty recipe from Weelicious. 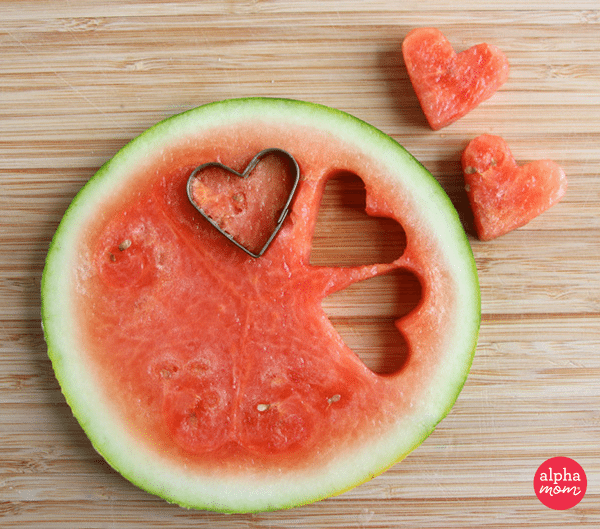 Next cut a half-inch thick slice from the watermelon. 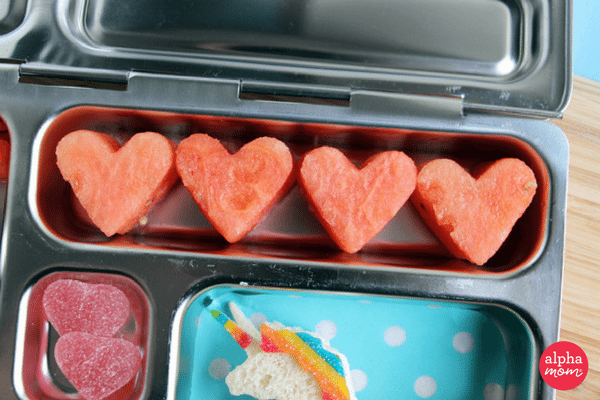 Use a mini heart cutter to cut out as many hearts as will fit in one of the sections of the lunch box. Put the hearts in the box, stacking them up if necessary. 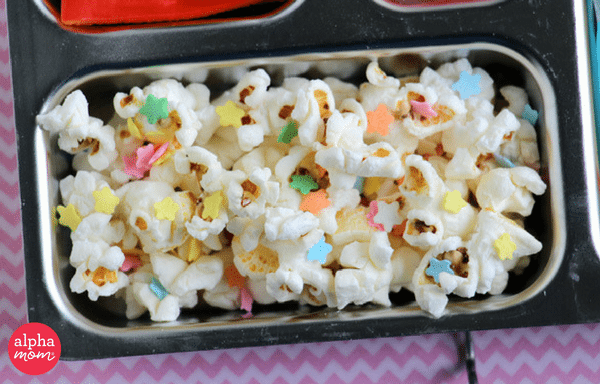 Fill the final section of the lunch box with popcorn, then shake a few sprinkles over it for even more beautiful rainbow fun. Finally, add a few cute candies to the tiny little compartment. 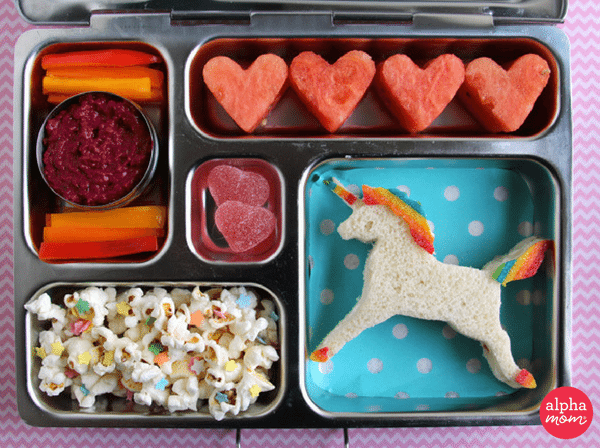 You have now made the most adorable lunch in the world! Web Coolness: A magical unicorn bento box, Cheesecake M&M's and more.